Race 1 of the Winning Group JJ Giltinan 18ft Skiff Championship on Sydney Harbour was won by the defending champions, New Zealand’s Honda Marine team of Dave McDiarmid, Matt Steven and Brad Collins. Provisionally, Honda Marine defeated Winning Group of John Winning Jr., Sam Newton and Seve Jarvin, with Smeg og Michael Coxon, Ricky Bridge and Mike McKensey a further 18 seconds back in third place. The race was sailed in a 10-15-knot NE breeze with all teams electing to use their bigger No. 1 rigs. 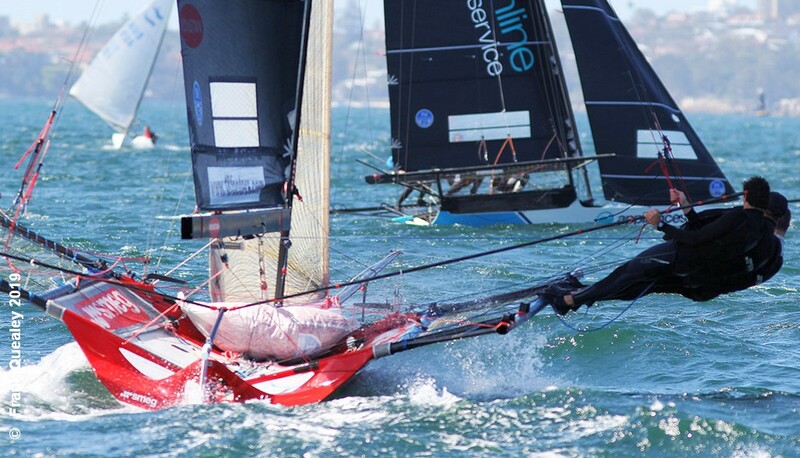 The Winning Group 2019 JJ Giltinan 18ft Skiff Championship Race Dates: Saturday 2 March and Tuesday 5 to Sunday 10 March.